1) Instead of just using Groovy to build a TypedTableModel with static values, I wanted to get the data from an external source. I chose a Twitter search with the #Pentaho hashtag. NOTE to Mac users: I don't know how to do this with the Mac application distribution, it's probably not difficult but I usually just download the regular distribution and run the shell script to start PRD. Note that I am reading in token info from the environment, you can also change this to use System properties or just hard code them in, although I (and the folks at Twitter4J) highly recommend against it. Perhaps the best approach is to require some/all of the tokens as report parameters. I didn't try this but I suspect it's quite possible with a scripted datasource. For goal #3, I think both the creation of the model and the population of the model with data speak to how easy and succinct it is. Take a look at the BeanShell sample (which *almost compiles to Groovy) for the Sample report with a Scripted Datasource to see how much more verbose it is. I use the "as" keyword/idiom quite often in Groovy, usually when interacting with a Java API. Anyway, that's all there is to it! The script creates a 3-column table containing the last 100 tweets mentioning "#pentaho", with the columns being the tweeter's screen name, the date the tweet was created, and the text of the tweet itself. Be careful not to exceed your rate limit; I didn't put in a try/catch for the search call, but you can do that in order to return an empty table or something as you like. 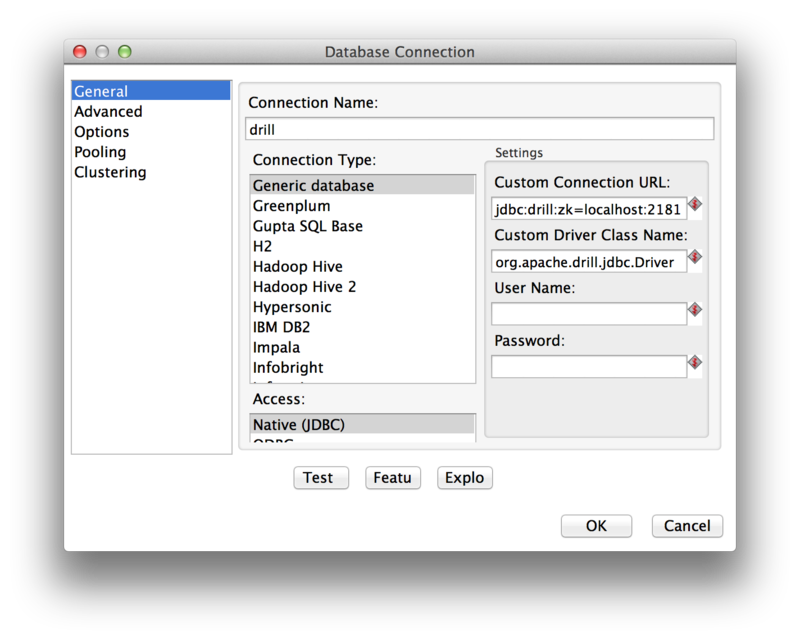 One of the non-Pentaho side projects I've become interested in is Apache Drill, I like all the different aspects of it and hope to contribute in some meaningful way shortly :) As a first step, without touching any code, I thought I'd see if I could configure PDI and Drill to play nicely together. My Proof-Of-Concept was a single Table Input step in PDI, using a Generic driver to point at my local Drill instance. I was able to query the datasources as described in the Drill wiki. 1) Install Drill and Zookeeper. 4) Open PDI and create a new Transformation with a Table Input step. Click the Test button, it may take a while the first time but it should come back with Success. 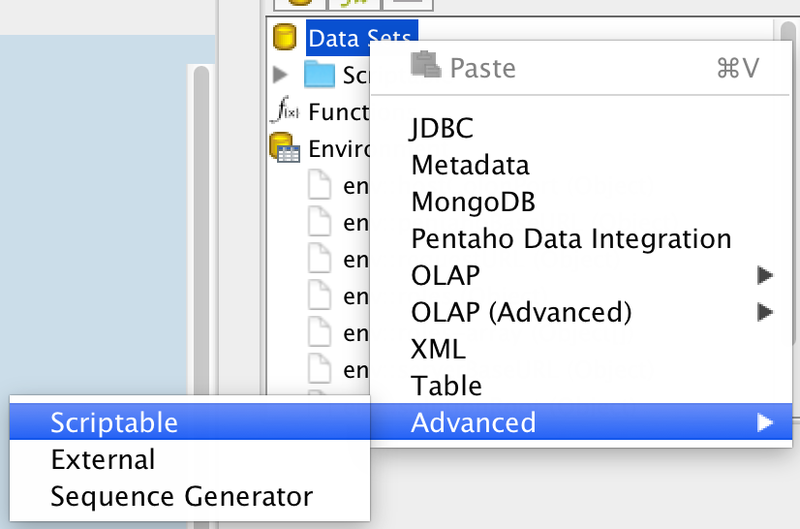 Don't click the Explore button or try to look for tables or columns, there is an Unsupported Operation in a few of the JDBC calls. The reason I've found is usually that a Drill class has subclassed an Avatica class and hasn't overridden the methods that PDI is calling. This is common with newer technologies that provide JDBC drivers; the JDBC API is huge so many young drivers don't implement all the methods. I've written quite a few plugins for Pentaho Data Integration, some are "finished" in terms of being in the PDI Marketplace, and some are still works in progress, Proofs of Concept, etc. The usual pattern for my plugins is to integrate some 3rd party open-source tech with PDI. For one-JAR solutions, this is pretty straightforward and rarely causes problems. For larger projects, however, this can be quite painful. When a plugin is loaded into PDI, a new self-first ClassLoader is created, the JARs at the root of the plugin folder are scanned for plugin type annotations and plugin.xml files, and then the JARs in the lib/ folder of the plugin are added to the ClassLoader. This allows plugins to (sometimes) override the versions of JARs that are provided with PDI, and to provide their own JARs in a sandbox of sorts, so as not to infiltrate or influence other plugins. However there are a few JARs that always seem to cause problems, where a plugin's version of the JAR will not play well with the version provided by PDI. Slf4J is one of these, as are the Jersey JARs. A lot of it has to do with which PDI classes are trying to use which of its own loaded classes while operating using a plugin which might have the same class in its own classloader. In this case, there are two separate versions of the class in the JVM, one loaded by the App classloader, and one by the plugin's classloader. As long as it's only the plugin referencing the class, there should be no problem; however, if the "duplicate" class is passed to a PDI-loaded class, then a ClassCastException can occur, as even though they appear to be the same class (same fully-qualified class name, e.g. ), they are different due to the different classloaders. I've run into this a few times in my projects, so I finally wised up and wrote a small Groovy script to look for common JARs between two paths. This script ignores the versions on the JARs (assuming they're named in "normal" style (name-version.jar). 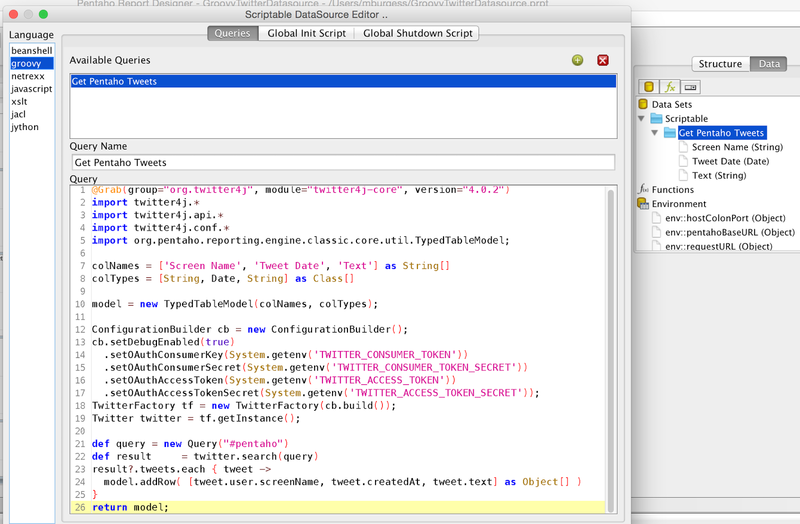 It doesn't work for JARs with classifiers (yet), it just does a quick substring looking for the last dash in the name. For each JAR "common" to the two paths, it then prints the versions in each path. This allows me to use transitive dependencies when building my plugin package, but then I can inspect which JARs might cause problems as they will already be provided by the PDI runtime when the plugin is deployed.